How do celebrities in Hollywood look so good all the time? They have help. Lots of help. Fashion consultants, make-up artists, and hair stylists create just the right look for any occasion. There is one accessory, however, that goes to every event—a smile. For this, the stars often turn to a cosmetic dentist. But these artistic dental professionals are not just in Hollywood. Here in Fayetteville, NC, cosmetic dentist Dr. Angela Ruff gives her patients Academy Award-winning smiles with porcelain veneers made by Hollywood's own "lab to the stars." Why Choose Ascot Aesthetic Implants & Dentistry for Porcelain Veneers? "Best dentist I've ever had! I now live overseas but make sure to schedule dental works and cleanings in order to get this excellent care. Dr. Ruff, Ms. Debbie, Chaunessa, and the rest of the team are a delight! This may be the best dentist practice in the world!" “Nothing but the best! Wonderful staff ,professional and friendly and the highest standards in patient care and outcome of treatment. If you have chipped, gapped, misshapen, or discolored teeth, then porcelain veneers may be the right cosmetic solution for you. At Ascot Aesthetic Implants & Dentistry, we take great pride in having developed a reputation for great cosmetic dentistry results. For Fayetteville, NC and surrounding communities, our office is the place to explore smile makeover options like porcelain veneers. Porcelain veneers can actually cover up problems that you might have with your smile’s appearance. These thin, tooth-shaped pieces of porcelain fit right over your front teeth, and this means that with a single procedure, we may be able to correct many problems. Porcelain veneers are a popular choice for cosmetic restorations because the look almost identical to natural tooth enamel. 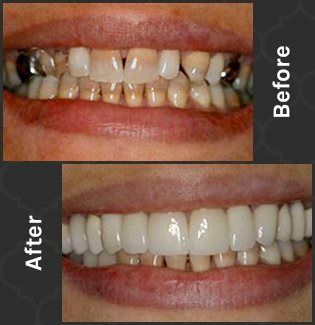 Porcelain veneers can easily modify the size, shape, and even color of your veneers to better improve your smile. Porcelain veneers are also stain-resistant and stronger than their resin alternative. Please view our smile gallery to see some of the amazing results, as well as see the below reviews of our patients who have completed some of these procedures.